As you approach this item you are skeptical with 0.04 oz of product for a $2.49 US / $3.99 CDN, my initial thought was "let me just try it...". 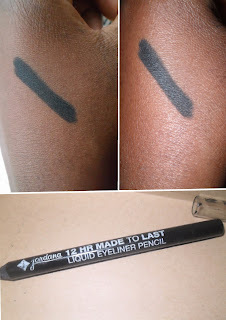 The company describes this liner as an intense and instant colour liner that is made to last. Let me do the honors of confirming. This product is fantastic, if I had three thumbs, I would give it three thumbs up! How to use this product: Line/tight line those pretty eyes of yours. Pros: The colour pay off is fantastic. The price can't get any better and it's paraben free. The product is so pigmented and soft it takes little to no effort to apply and see the results you are looking for. Cons: Lack of a wide variety colours for those bold beauties (think orange, gold, bronze, silver etc.) If you live in the USA these bad boys can be easily found in stores such as Walgreens; however us Canadians are limited on where we can find these unless we go on Amazon.com. However, do check your random Beauty Supplies my Canadian beauties(if your lucky you might stumble across them.) Also these liners are not hyopallergenic, so if your eyes are sensitive, you'll be out of luck. Final thoughts: I am a user of MUFE aqua liners and MAC smolder and feline or should I say I was... this product beats them both(by a landslide). I will do a detailed comparison post in the near future. Overall a fantastic buy. Oh and did I mention this bad boy doesn't budge? and I have OILY skin-truly made to last. Now that's fantastic. It comes in 6 colours from your basic black (which is JET BLACK-see picture)to a funky purple and blue.